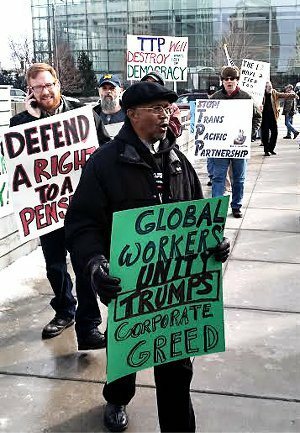 For the fifth year in a row, the rank-and-file autoworker advocacy group Autoworker Caravan protested outside the North American International Auto Show at Cobo Hall, in Detroit, on Jan. 12. This protest’s theme was the demand for a “people’s recovery.” In an Occupy-style mike check and skit, the question of “whose recovery?” was asked several times. The answers pointed out that while the auto bosses and bankers are celebrating the recovery of their profit margins, those for whom there has been no recovery include first- and second-tier U.S. autoworkers, autoworkers in low-wage countries, and Detroit’s city workers, retirees and unemployed. The protest also emphasized global working-class unity with the chant “Colombia to Michigan, solidarity is going to win!” Autoworker Caravan has brought the struggle of General Motors workers in Bogotá, Colombia — who were fired after they were injured — to the attention of shop floor workers in Detroit and other cities. The group has raised more than $15,000 to sustain the families of fired workers, members of the Association of Injured Workers and Ex-workers of GM Colmotores, who have maintained a tent occupation across from the U.S. Embassy in Bogotá for almost 900 days. A statement of solidarity with the protest and with Detroit’s autoworkers from Brazilian GM workers was read. These workers are facing mass layoffs in São José dos Campos. GM is not allowing the workers to transfer to a new plant, which is being built and will employ lower-paid workers. While their action was being filmed by a German TV crew, autoworkers chanted “Keep Opel open!” — a reference to a GM plant in Bochum, Germany, slated for closing this year. The Trans-Pacific Partnership, characterized as “NAFTA on steroids,” was targeted in a second mike check. The point was made that “if you’re in the 1%, TPP is heaven-sent,” but for workers on either side of the Pacific it’s a bad deal. The demonstrators took a stand in support of Detroit city workers and residents who are under attack through the bankruptcy proceedings. Chants against the banks that have destroyed the city were popular. Another aspect of the “people’s recovery” platform that was raised was the need to reverse the concessions of recent auto contracts and eradicate two-tier and multi-tier pay and benefit structures. On Jan. 26, Autoworker Caravan will meet to discuss bringing its message to the United Auto Workers Convention in June as well as building workers’ power on the shop floor. This article also appeared in Workers.org.